Add olive oil to a deep dish frying pan and bring to medium high heat. Once hot, tip the pan side to side to evenly coat the oil. Add in and stir the onions until softened, about 3 minutes. Next, stir in the brown rice. Sizzle and stir for about 5 minutes until the rice becomes very lightly browned. Stir in the salt, garlic, celery and ginger powder. Continue to stir, making sure all spices are evenly distributed with the rice, about 3 minutes. Now add in purified water to about half an inch ABOVE the rice and allow it to cook. Give it a couple more stirs to evenly distribute the water with the rice. This will be the LAST time you stir. Bring down the heat medium and cover. Remember, DO NOT STIR THE RICE. This is the most important tip at this point for the fluffiest rice. Just allow the rice to cook. After about 15 or 20 minutes, the water will get low. Once you can’t see the water, simply spill in a little at a time at each side but DO NOT EXCEED the rice line! Enough water should only be added to cover the bottom of the pan. This creates a steaming effect for the rice and gives it that fluffy texture. Do this once or twice, just until the rice is almost done. 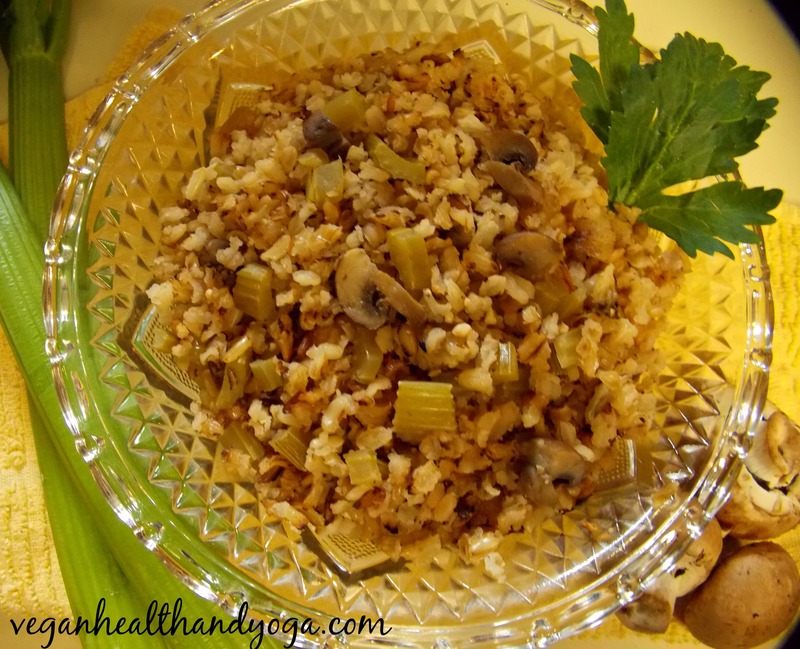 When the rice is almost cooked, top with the mushrooms but do NOT stir them in. Keep covered and allow the mushrooms to cook and steam for another 3-5 minutes. They will shrink and nestle into rice during this time. Once the rice is fluffy and fully cooked, remove from heat and keep it covered to steam off any remaining water into the rice. Your done! Makes about 6-8 servings.